Find Glenmoore on Google Maps to visit my ATB Shop at 1708 Horse Shoe Pike for handmade gifts. We are conveniently located just 5 minutes up 322/Manor Ave just down the road from Downingtown, Honey Brook and Coastesville off of the 30 Bypass. We are just 15 minutes from Exton, West Chester, and Morgantown. ATB Shop offers handmade goods exclusively designed by a community of local moms and artists. ATB Shop offers custom gifts for expectant and experienced mothers, babies and big kids too. Everything comes gift wrapped and prices include tax. A Time to be Born, LLC is owned by Shelley, a stay-at-home mother of three. I started out as a certified birth and postpartum Doula, entered motherhood, became an affiliated Bradley Method Natural Childbirth Educator, and now I own my own ATB Shop! Personally, I love handmade unique goods, so I started making gifts for others and hence ATB was born. ATB is a growing community of local artisans, mostly other moms like me who are using their talents to create goods for mothers and their children. Our goal is to provide something unique, natural and practical for those in the childbearing year and beyond. All my products are bonded and sealed with my ATB label, tied with raffia and come with a description tag. ATB prices always include tax and come gift wrapped in a decorative eco-friendly recyclable bag. 10% of all sales support local charities and every purchase is supporting the local community of moms and aspiring artists. We all appreciate your support! Everything is handmade custom in the USA. We strive to use natural materials to create gifts that will bless mothers, babies and big kids too. We hope that you enjoy your gift. Leggings for little ones: These are stylish and functional leg (or arm) warmers for babies and toddlers. They make changing diapers much simpler than tights, they protect little crawler’s knees. They are seasonal and fabulous as a second layer for cold climates and they provide great protection from the sun when its warm out. They come in one size, 13inches. Burp Cloths: These are made with a pre-washed Indian pre-fold cloth diaper that are 100% cotton and become softer and more absorbent with each wash. On the front they come in assorted fabric designs, are accented with a ribbon tag and are totally cute and practical! Top stitched for durability. These come in one size 9”W x 13”L. Hair Flair Clip: Metal salon clip, glamorously decorated with super fun ribbon and embellishments. They are easy to clip into little ones hair, made with Velcro on the inside to help grasp and only require a few strands. Measures 1 ¾ by just shy of a ½ .What girl wouldn’t want some of these? These are NOT toys. Choking hazard, keep out of mouths. Eat@Moms (nursing covers): Perfect for mom who wants to be modest while nursing in public or wants to nurse in private without isolating herself from others. These are made with light weight fabric (no more fussing with heavy blankets), a ribbon to secure around neck, a C-shaped boning in front (to give you that important eye-eye contact with your baby), and terry cloth corners (to dap those dribbles)! It can also be used as a stroller/car seat sun shade cover, or an emergency substitute blanket or changing pad. Clutch Mama: A clutch purse for the on-the-go mom with a baby/toddler who only needs a spare diaper and wipes and a clean changing surface. Leave the diaper bag behind and just toss this in your purse, stroller, grocery cart, or in the car for convenient access. It measures 6”W x 12”L as a purse and opens to 18”W x 12”L as changing pad, 2 adjustable snaps to close front, easy open with one hand snaps line the sides, and a removable wrist band. 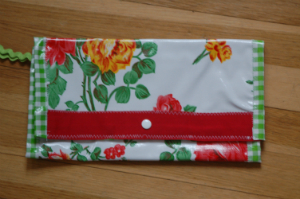 It’s made of oil cloth for easy cleaning/durability. Wipe down with a cloth. DO NOT wash, put in a dryer, iron or dry clean. 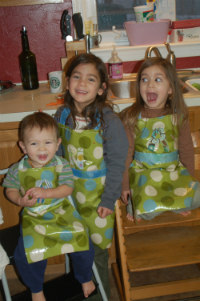 Wipe clean aprons are made with oil cloth fabric. Perfect for arts and crafts or "helping" in the kitchen, this apron will keep your toddler clean(er). Ideal for age 2-6 years old. 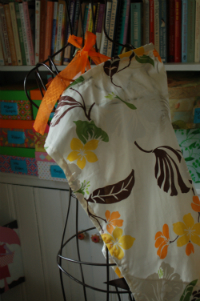 Measures 16" W x 21" L, with a stylish ribbon neck and waist adjustable ties. Wipe down with a cloth. DO NOT wash, put in a dryer, iron or dry clean. I am not on Etsy yet but coming soon, but please Like me on my A Time to be Born Facebook page and check out all my current stock in my photo albums on sale now! Or check out Lucia K. Jewelry!